“Thank you so much for the beautiful Redouté card you sent!”, my friend said when I called her on her birthday the other day. 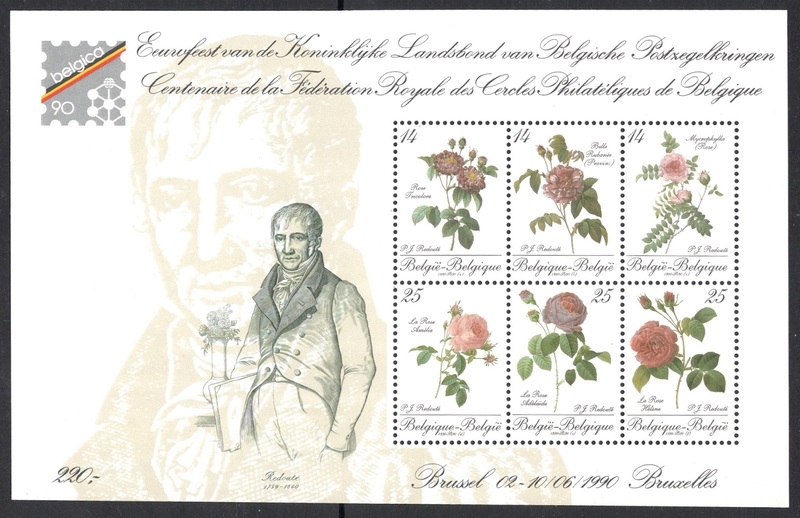 Blissfully unaware I had simply chosen a flower card I liked, but it turned out to have been a botanical painting by the famous Belgian painter Pierre-Joseph Redouté. No sooner had she said it or it had slipped into my unconsciousness again, until I had to browse the Belgian catalogue for a completely unrelated matter. Suddenly I saw all these Redouté issues and I was hooked. In the run up to ‘Belgica 90’, an exhibition to mark the centenary of the Royal National Belgian Philatelic Circle, the Belgian post issued special stamps and miniature sheets from 1988 onwards, each with a surcharge for a philatelic fund and each one depicting roses painted by Redouté. 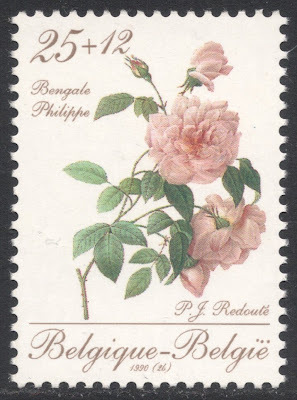 Redouté was a court painter in the early 19 century, for the French Queen Marie-Antoinette and later the Belgian Queen Louise-Marie. 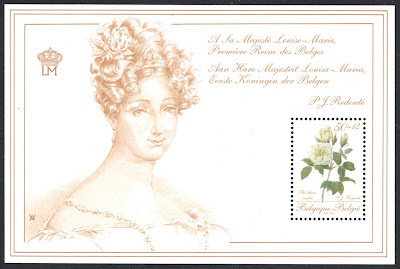 We find different portraits of her on each of the miniature sheets. 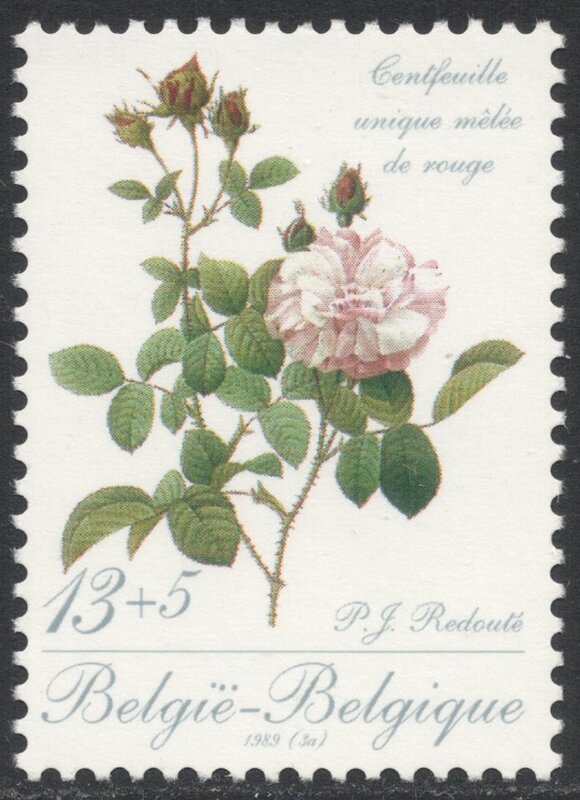 Redouté was famous for his botanical work, having painted over two thousand different species, and he is particularly well-known for his roses. 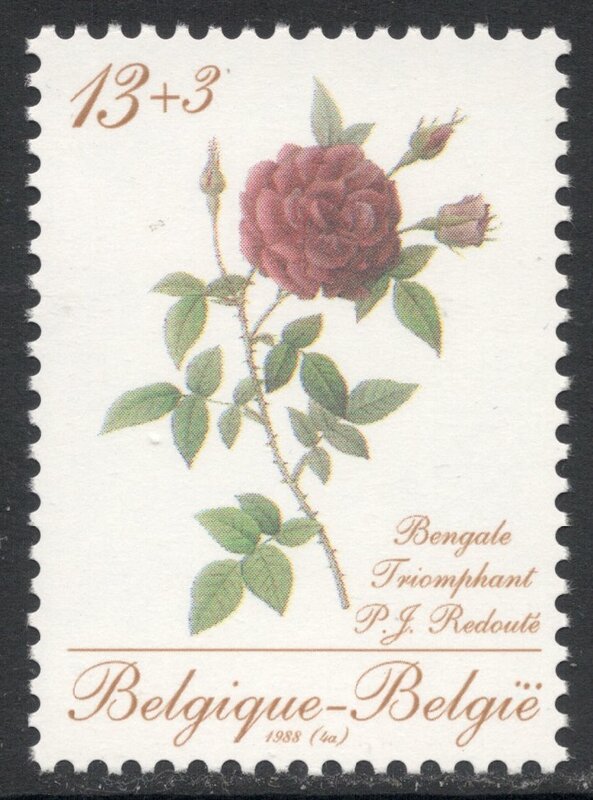 It is these which are featured on all the stamps, with the whole series being given the name ‘Sixty Roses for a Queen’. After three regular annual issues, each consisting of two sheet stamps and a miniature sheet, the series was completed with an extra special miniature sheet, which included six stamps and an engraved portrait (by Paul Huybrechts) of the master painter known as the ‘Raphael of Flowers’. 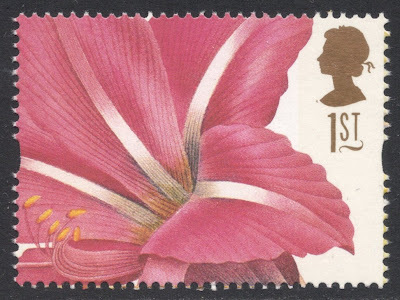 This is by far the most desirable of all issues, as far as availability is concerned. 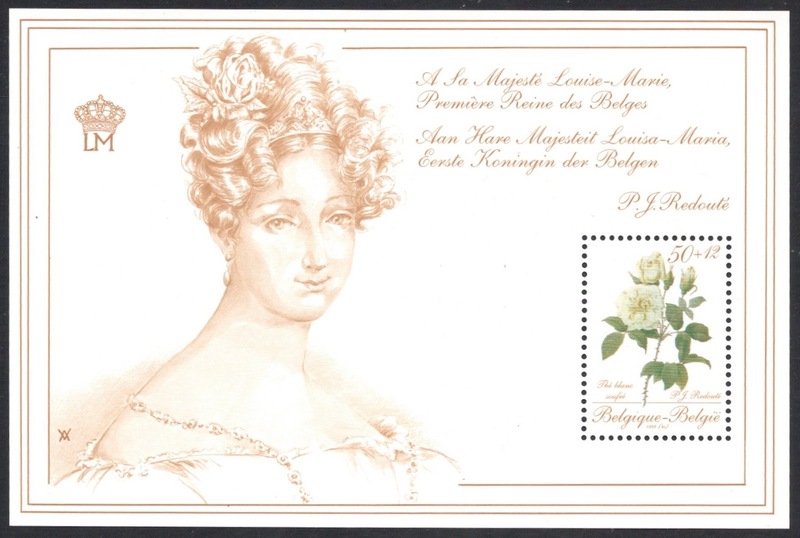 Initially it was only for sale at the Belgica 90 exhibition, though it later did go on general sale as well for a bit. I quite like the delicate nature of the issue though it could be said that the paintings are maybe a bit too delicate for reproduction on such a small scale. If you like things a bit more brash and colourful, you can always opt for the one and only other Redouté stamp I managed to find, right here under my very nose. Turns out we’ve been sticking Redouté’s beautiful Hippeastrum rutilum on our mail ever since 1997!